The Smartest Kids in the World by Amanda Ripley was a really interesting book on world education told in large part through the stories of three different U.S. exchange students who studied abroad for a year, and the results in those countries from a standardized test taken by students across the world. Ripley began the book by covering this standardized PISA test which started in 2000 with 43 countries and measures 15-year-old students’ abilities to think critically and make reasoned arguments. The countries that the three students Ripley chronicled went to were Finland, Poland and South Korea and students in each of these countries scored better on PISA tests than did U.S. students. 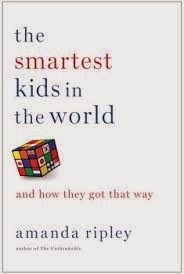 Shown in the book are definite differences in how each country achieves that success, with the success of students in South Korea coming from a brutally competitive and pressure-filled South Korean standardized test (other than PISA), Poland from a top-down initiative that radically overhauled education and Finland the most organic approach with a particular focus on having the very best teachers possible. Even with these differences in how various countries were achieving high PISA scores, especially compared to the U.S., the overriding thing from Ripley’s book was that learning for students largely a function of how seriously they take school, and that in turn from how seriously students see adults taking their learning. The first example of this that Ripley noted was the aforementioned one from Finland and how students there see how challenging it is to become a teacher and the level of earned prestige accorded teachers in Finland. In opposition to this, the profession of teaching in the U.S. has much less cache and lower barriers to entry. A second example from Ripley of how U.S. schools don’t give students reason to take learing as seriously as schools in other countries do is the importance of sports in middle and high school here. Sports are a much smaller aspect of the school experience in other parts of the world so the message elsewhere is a clear one that school is for learning and it’s important. This same idea of sports and their import in U.S. schools also relates to the prior example of teachers with U.S. high school teachers who double as coaches, in some cases with them having gone into teaching in order to coach sports at the school. Ripley lays out the additional reasons of expectation and consequence for U.S. students to not take school as seriously as it’s taken elsewhere. While one all-important test in South Korea determining people’s futures may be a bit much, there’s no question that students there are expected to put their all into the test and understand the negative ramifications of scoring poorly on it. In the U.S., it’s all too common for students to be set up to pass academically, through either early on being put on a remedial track with lower standards or teachers giving passing marks based on effort and helping students stuck during a test. The idea of course is to not have kids fail (both for their self-confidence and because it could reflect poorly on the school and the empire-like administrations built up around many schools), but the result of course is that students both aren't having as much asked of them and know they’ll get bailed out if stuck on something in school. Also covered by Ripley in the book was how rather than focusing on what can be done to improve education in the U.S., an approach gets taken by many school administrators and teachers of blaming external factors like poverty or parents not being involved enough. Ripley noted that these things in no way have to lead to a poor education, but it’s simply easier to talk about variables beyond control rather than to fix things that can be improved. In relation to parental involvement specifically, her research found no correlation between a student’s success and parental involvement in things like PTAs. Ripley noted that it’s not that parental involvement in education not important, as reading to kids when they’re young and then having real discussions with them about what they’re learning, current events, books and movies can have a huge impact on learning, just that oftentimes simple involvement doesn't necessarily do much. The concept that seems to keep coming through in Ripley’s book is that kids are smart and figure out what's important to adults in relation to education, whether those adults are parents, people who set curriculum, people who hire teachers or teachers themselves. If an adult doesn't clearly have education as the be-all end-all reason for school, why should the student? To this end, one anecdote from Ripley that I loved was about the Finnish stoner kid encountered by one of the three U.S. exchange students. The stoner kid looked like U.S. high school stoner kids, only difference was the one in Finland took school just as seriously as everyone else there. A couple of additional things I noted out of this excellent book were that there’s apparently additional information available on the author’s website and that Ripley gives BASIS school students as the only example of alternative U.S. school students doing better than similar students in public school.